Sunday was another very hot sunny day, which partly explains why just two volunteers came to dig. 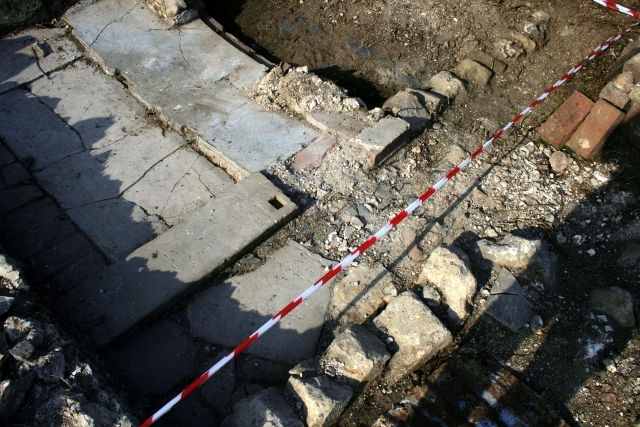 The area excavated was immediately to the east of the outside toilet and immediately to the south of the front garden boundary wall – an area of about 1.5m by 2m. The tools used were a chillington hoe (a mattock like tool), trowels and brushes. The demolition rubble we dug through was generally dry and dusty, though deeper levels did contain some moisture. such as a that caused by a bulldozer, or artillery shells. The difference between a find and a feature is that finds can relatively easily be picked up and become part of a collection in a museum. 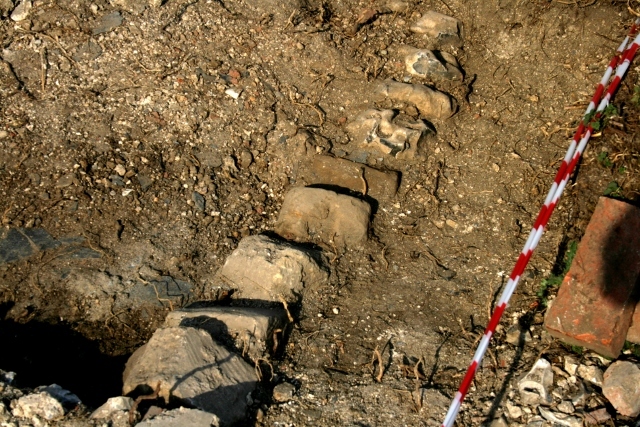 Finds are always related to the context in which they are found. As I have said before, my AD(H)D and Asperger’s results in my finding multi-tasking extremely difficult; concentrating on managing the digging and the recording of the contexts we find. But I have managed to take photos and write about what we find in this blog. Perhaps I need to record a little more detail in this blog. The blog is easier to do than a complicated form – easier to describe the fuzzy nature of the contexts that I find. Demolition rubble E of toilet. The initial context we excavated was the demolition rubble fill (in my list of contexts this is number 72). Friday we removed the topsoil from this part of this 2m x 2m grid square and started to carefully excavate the demolition fill. Since it seemed to extend down quite a way, on Sunday we dug through it a little quicker with the help of my Chillington hoe. Trowels and brushes were also used. 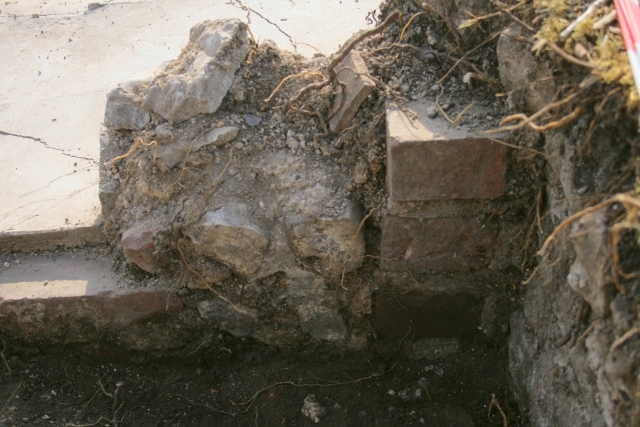 It was of the same composition as other demolition rubble found in adjacent areas; a large amount of a crumbly yellowish lime mortar with a large number of flints; some bricks, mostly unfrogged and unglazed, though some had a blue glaze, and a few had a shallow frog (see articles on bricks and brickwork); a lot of slate roof tiles; a wide variety of terracotta tile fragments in very small quantities; and a grey mortar or plaster used for rendering was occasionally found, often attached to larger fragments of masonry, but finished at an angle suggestive of the top of a wall. Intact masonry on site has been identified as bungaroosh, though the ‘double struck’ or ‘bird’s beak’ pointed flint coursing would indicate otherwise. It is the collapsed remains of all these walls – garden, toilet, and the whole gable front of house – that formed the layer we excavated. 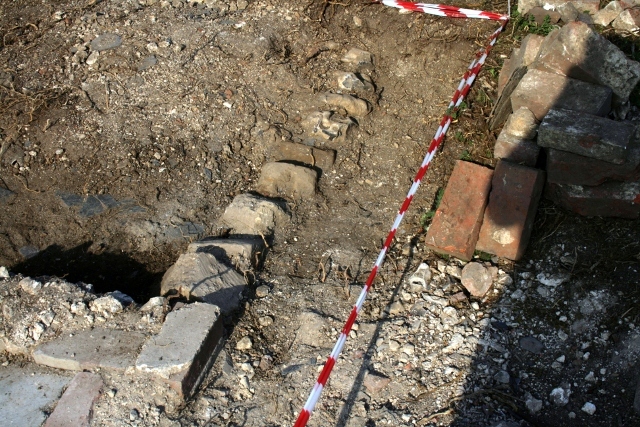 The brick quoin at the SE corner of the outside toilet wall (context number 75) was further cleaned up. It would be good to clean it up a little further to reveal the course of bricks upon which what is visible sits. The excavated portion consists of an ‘L’ shape, with one of the brick headers facing the interior of the toilet, overlapping with an exterior face of ‘double struck’/’bird’s beak’ delineated flint coursing. As can be seen in the photograph above, the outer face of the southern part of the toilet’s east wall (context 76), was also cleaned up. The double struck/bird’s beak pointing between the flint courses appears identical to that of the rest of the building, strongly indicating that the toilet may have been built at the same time as the original cottage and barns. This type of pointing was apparently most commonly used in Victorian times, but has been little described – at least on the internet. It would be useful to look for other examples of this pointing on walls and buildings in nearby villages and towns. Is it specially associated with a particular period in history, and/or locality? N part of E wall of toilet. The northern part of the east wall of the toilet (context 77) was of similar construction to the other end of this wall, but of a slightly shorter length. It was also in a bad state of preservation, but enough of it remains to show that the flint coursing matched that of the brick quoin to which it was bonded. Sandwiched between the garden boundary wall and this toilet wall we uncovered three courses of a brick quoin (context 98). These were all header laid, across the complete width of the wall. They merely butted against the adjacent walls. ‘Bucket door’ of outside toilet. 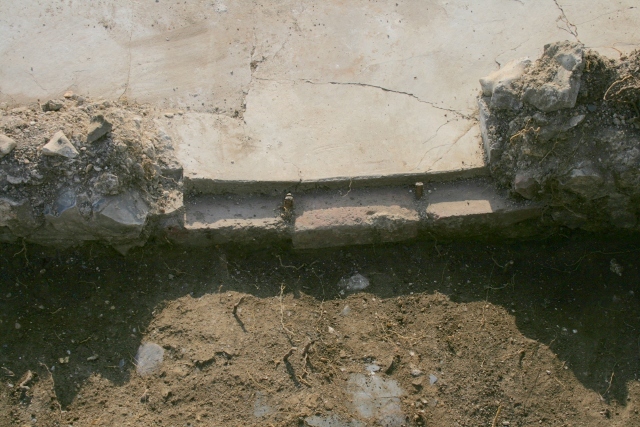 Across the front edge of the gap for the side door – to access the bucket – a sill of three stretcher laid bricks (context 97) was uncovered, which held three iron pins. The bricks were flush with the outer face of the wall, and butted against the mortar slab on which the bucket would have sat, and were about an inch below it. It would have held in place the wooden frame for the door. Some stone edges to paths between front gate, the toilet and the front door. 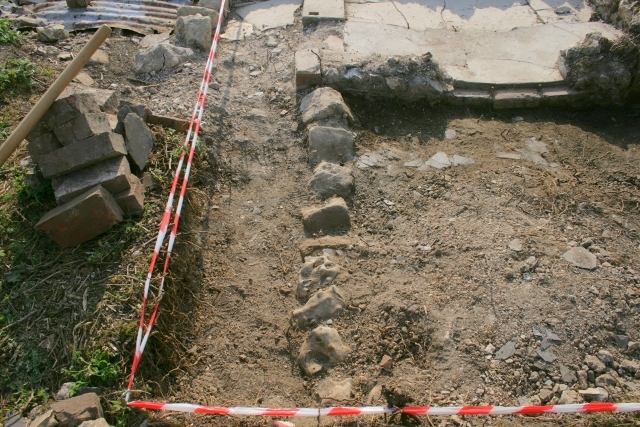 These diagonally laid stones and flint nodules (context 96) were distinguished from the demolition rubble in which they were embedded because of a lack of attached mortar, and their more solid placement. They probably formed the north edge of a path which ran approximately east-west. The front garden gate, towards which it is expected to turn, was not found in the grid square in which we were excavating. It seems that it is further east, perhaps only a few tens of centimetres, than was indicated on our only plan of the site. The last flint nodule in the trench may be on the inside of the turn of the path towards the gate. At the west end of this part of the 2x2m grid square the demolition fill was fully excavated. 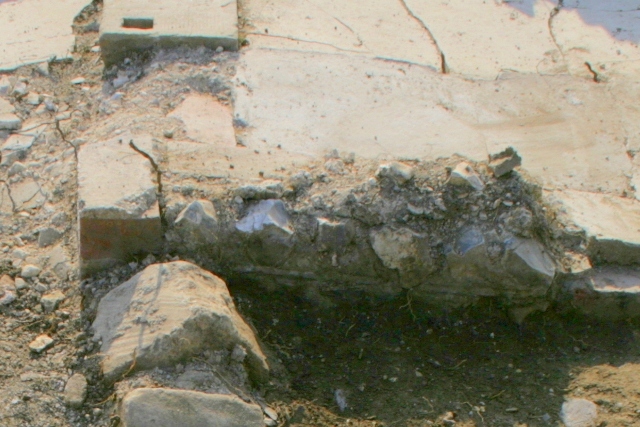 The transition to the garden soil below was characterised by a layer of roofing slate (seen in the far side of the above photo), but this was not always easy to spot – for two reasons; firstly, earthworms, aided by root activity, have brought up or formed effectively the same garden soil into and above the demolition rubble layer; and, secondly, flint, brick and slate fragments were also found in the garden soil below – the debris from a hundred years of wear and tear to the buildings and other structures. This garden soil ‘fill’ was our 105th context! 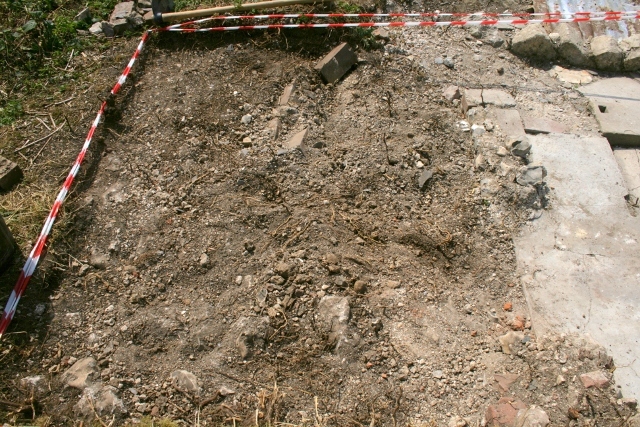 Initial excavation of the top of this fill, right in the corner between the garden wall and the toilet, revealed a high concentration of ceramic and glass fragments, more so than in the demolition fill above, though less than in an earlier trench between the front of the house and the path to the toilet. We even found the entire lid of a brown teapot – a broken spout in the same fabric had been found in the garden the other side of the toilet. Immediately adjacent to, but technically outside our trench, was the north boundary wall (context 102). If you look carefully at the above photo (click for a larger view) the incised lines between the flint courses are at an angle to the roughly horizontal base to our trench. They are a good indicator of the slope of the original ground surface.